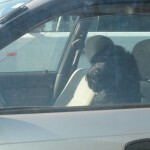 Auckland, New Zealand — Human law enforcement is being tough on Monty, the famous car-driving schnauzer. Recently, Monty has been serving time in tha Dogg Pound after being detained for the charges of speeding and resisting arrest. The arrest preceded a court appearance in which Monty, barking angrily at the judge while his lawyer answered questions, was denied bail due to unnecessary courtroom outbursts bordering on contempt. How unfortunate. What was once considered a unique story of a dog bridging the canine-human gap has now turned ugly. We sincerely hope they teach Monty how to ‘speak’ and ‘shake hands’ before things get really out of control and he ends up serving hard time.